Spring is finally here! 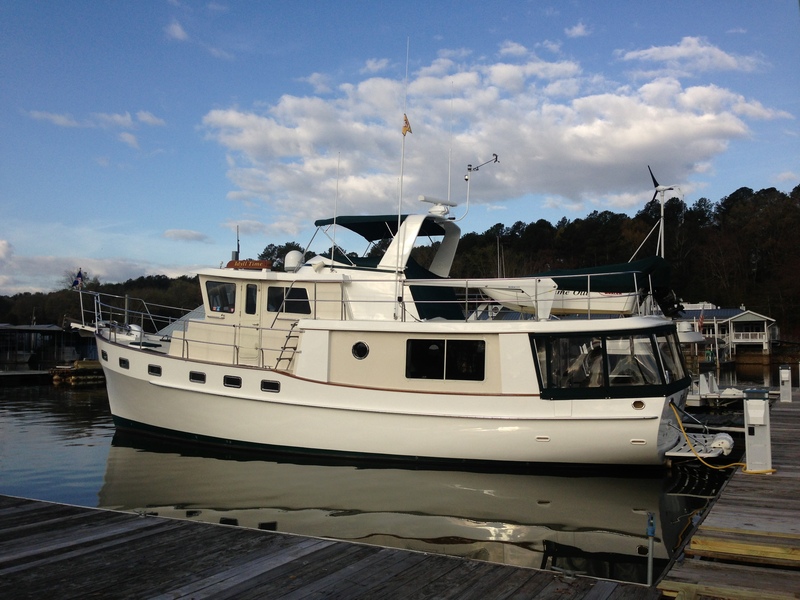 With warmer weather and the river levels rising, it is time to go cruising. Idyll Time has patiently awaited our return. A turn of the key and she starts up just as if she was run yesterday. Our destination is Mobile, Alabama. 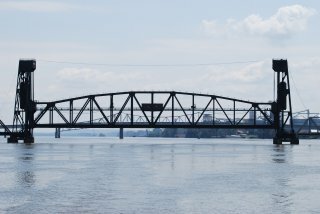 Our route will take us 262 miles along with 5 locks down the TN River to the junction of the Tenn-Tom Waterway. 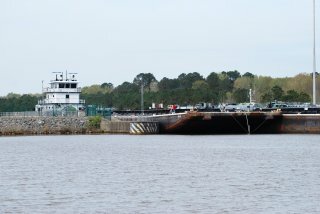 It will then be another 450 miles and 12 more locks on the Tenn-Tom to Mobile. We plan on doing a haul out in Mobile for bottom pain and also some maintenance work on our stabilizers. It feels good to be aboard and cruising. Before leaving the yacht club, we add 400 gallons of fuel to the 600 already onboard. With full water and fuel along with all our stuff, IT sits heavy in the water. Both the birds and Sebastian seem happy to be back aboard. 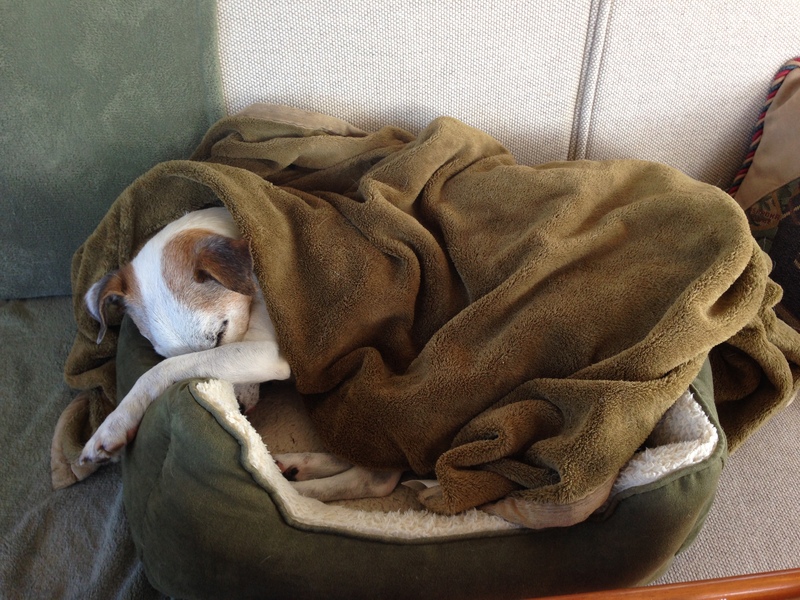 Once underway, Sebastian assumes his usual position, snuggled up in his blanket asleep in the pilot house. Chickamauga Lock, our first and only of the day, is ready and waiting when we arrive. 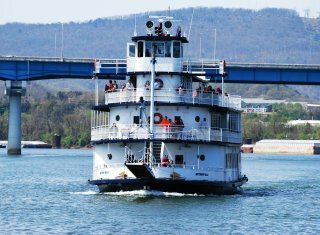 We have an easy 48 foot lock down and are soon passing by the vibrant downtown Chattanooga waterfront. 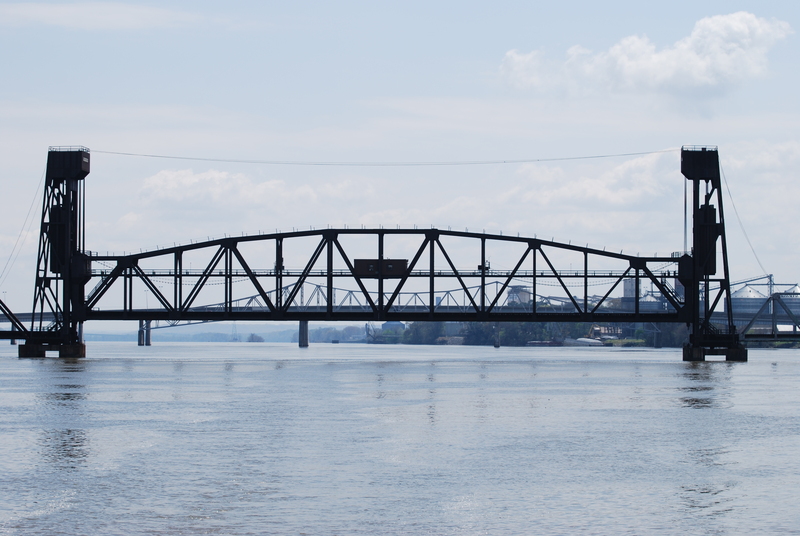 Today’s travel is through a stretch of river known as the “Grand Canynon of the Tennessee”. 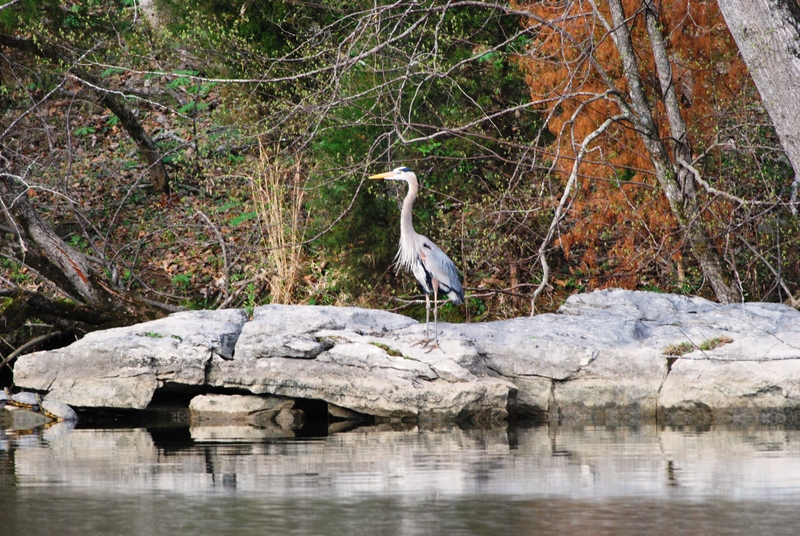 This section offers some of the most stunning scenery of anywhere found along the TN River. The river narrows with many twists and turns as we weave through the forested mountains. Other than a stray Bass fisherman, we have the river all to ourselves. Our anchorage for the evening is a small cove at the base of Little Cedar Mountain. This has become one of our favorite places to anchor. Other than the multitude of waterfowl out fishing for dinner, we are all alone. It turned cold overnight but we were warm and snug in our new fleece sheets. These are a new addition this year and they are wonderful! (I would highly recommend these to anyone cruising in colder climates.) Sebastian is a little out of sorts this morning. He has an ear infection and we have been washing out his ears every day. Today he is tilting his head sideways and is wobbly. His balance seems to be off. Walking him out on the front deck is a little challenging. He is very unsteady on his feet and keeps falling over. We have set up a second potty area for him in the guest shower. Before leaving home, we had purchased a second grass mat that would fit on the floor of the shower. We have tried several times to get him to do his business in this new location. So far we have had no luck. The little guy looks so pitiful as he staggers around. 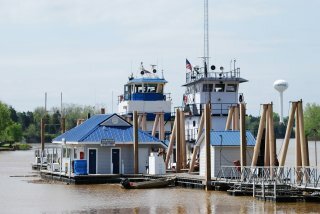 Just a few miles downstream from our anchorage is Nickajack Lock. 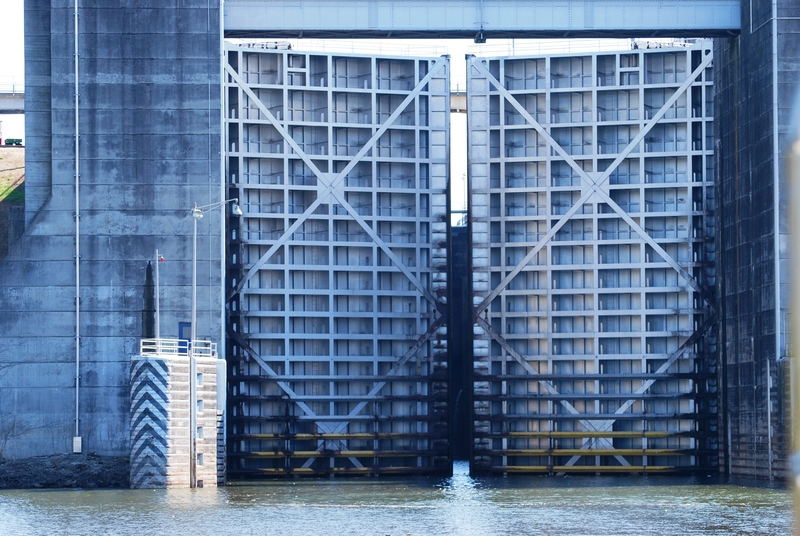 We are lucky to find the lock empty of barges or other boats. This is the newest lock on the river being built in 1967. We are quickly locked down the 39 feet and are on our way, now officially in the Nickajack Lake. It is a cold grey day with no other boats out on the water. It is times like this that we are thankful for our nice warm pilot house. The rain arrives just before reaching our stop for the evening, Guntersville Yacht Club. 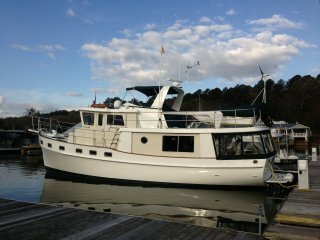 Our yacht club has reciprocity with Guntersville and we can stay here at no charge. One of the GYC members comes out to welcome us and help catch our lines. A deluge of rain falls from the sky just after we secure IT. Gusty winds, lightning, and heavy rain are forecast for tonight and tomorrow. This is a good spot to wait out the weather. We spend our lay over day doing some much needed cleaning of IT. The rain finally stops and we are able to take Sebastian for a walk this afternoon. He is doing much better today and is almost back to his old self. This evening we are invited by one of the resident GYC couples to watch a James Bond movie on the club house big screen. We hope to make up some mileage today after our rain delay. We are up at first light and off the dock by sunrise. 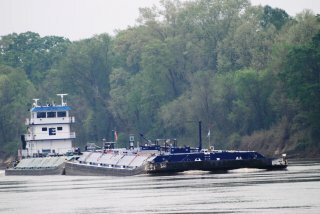 It is a 10 mile trip to the Guntersville lock. Our luck is still with us and we find the lock empty and waiting. There are actually two locks here, the main chamber and also a smaller auxiliary lock. We are put in the big lock and have another easy 39 foot drop. This brings us into Wheeler Lake. Exiting the lock, we find the river raging. The Dam flood gates are wide open dumping water down river from the heavy rains we had yesterday. The four knot current gives us a big push downstream. With lots of debris in the water, we remain on constant watch. The fat girl is flying down river doing almost 11 MPH. The sun has finally returned and it is a beautiful but still cold day. Farther down stream of the dam, the river widens and becomes much tamer. Navigation is easy with long stretches of a wide and deep channel with few channel markers. 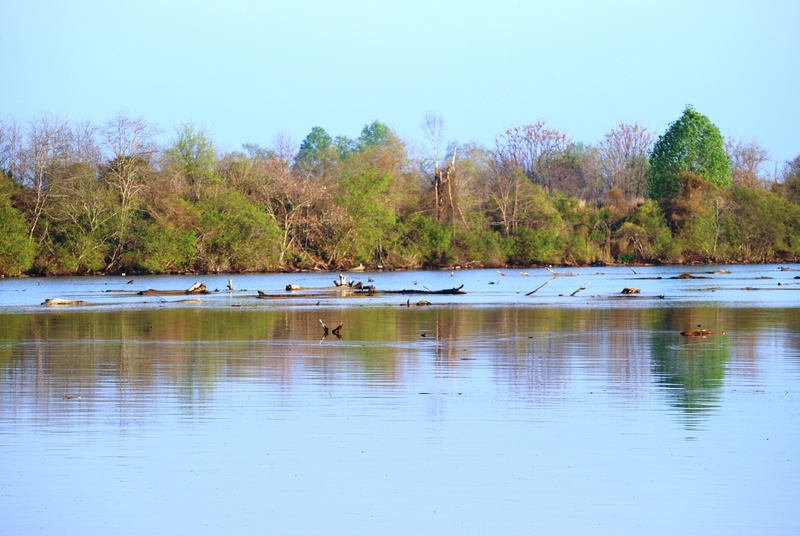 Just beyond the wooded river banks is the Redstone Arsenal and Huntsville NASA Rocket Center. 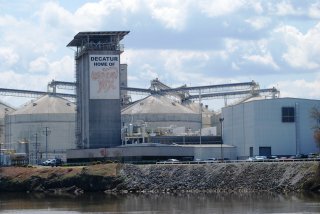 Our scenery changes as we reach the industrial area of Decatur, AL. We have a few minutes wait as a train is going over the RR Bridge. Once the train passes, the bridge tender raises the lift bridge and we are on our way. 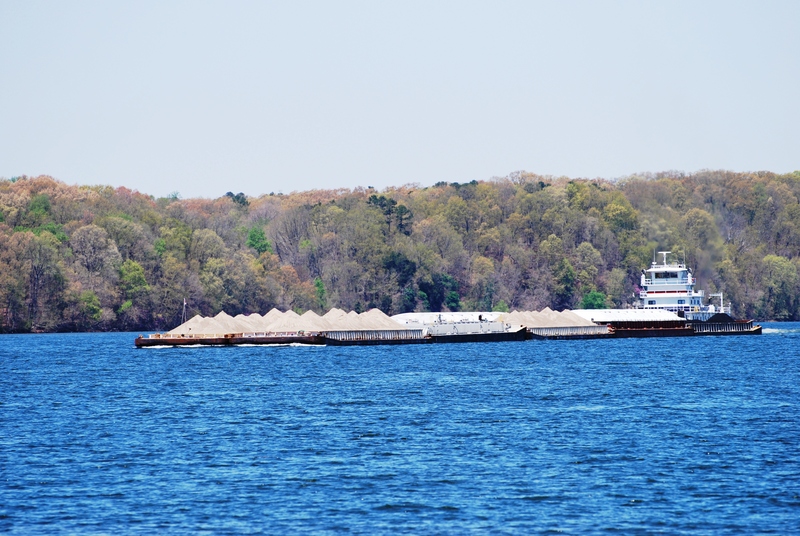 A few miles downriver we spot the Delta Mariner at dock. 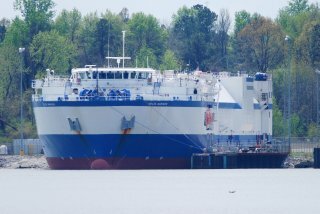 She is a cargo ship which transports rocket parts and booster rockets from the space center here to Cape Kennedy. We learned about her several years ago when we met her on a narrow part of the TN River. She is massive especially when passing close by her on a tight section of the river. No worries today since she is at dock. Just before reaching Wheeler lock, we decided to abort our planned destination of Turtle Creek Yacht Club. There are some strong thunder storms bearing down on us. We instead decided to stop at Joe Wheeler State Park, just one mile ahead. We have been here many times and it is a familiar destination. 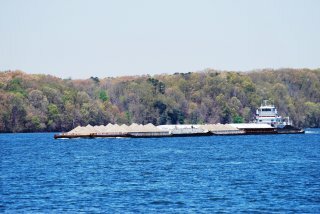 Other than a beautiful 60 ft. Marlow, we find the docks empty. 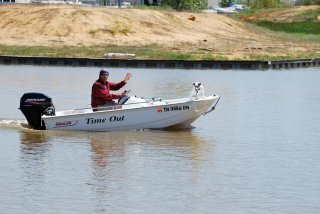 The Marlow owner sees us coming and is on the docks to catch our lines. We are very grateful as the wind is gusting and docking would have been difficult without some help. The storms soon pass and Sebastian is happy to go for a good long walk. As usual, we are away from the docks by 7:00 AM. Wheeler Lock is just ½ mile from the marina. 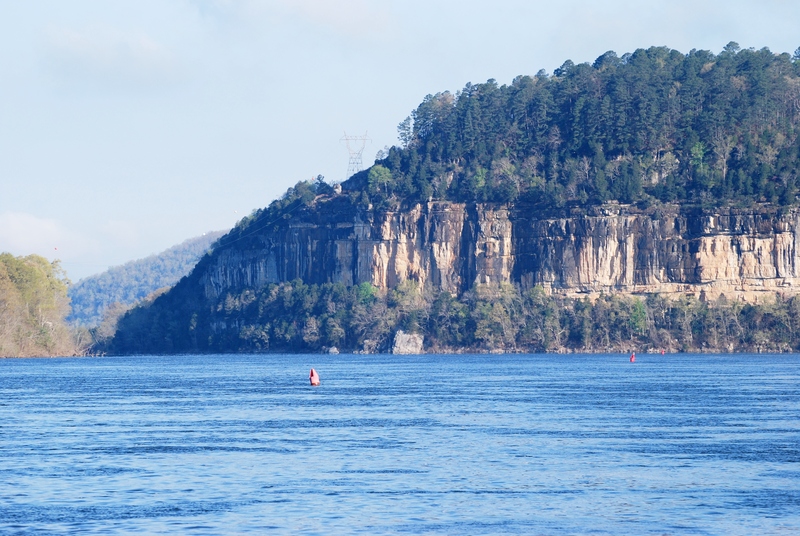 We have another quick lock through and continue our stair step down the Tennessee River into Wilson Lake. Today is a beautiful day with highs in the 60’s and clear skies. There is no rain in the forecast for the next few days. 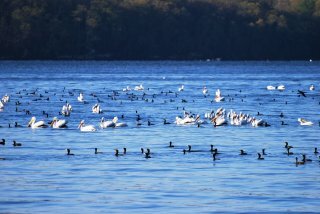 For the last several days we have been seeing flocks of white pelicans along with black cormorants. 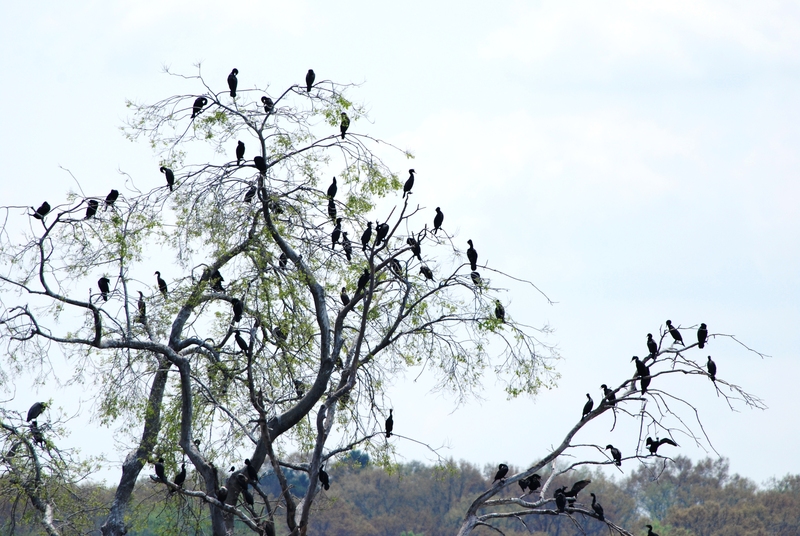 This area seems to be a winter nesting ground for the birds. 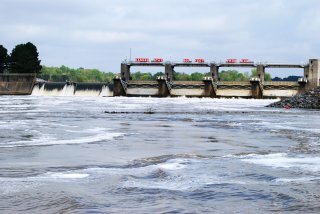 After a short travel on Wilson Lake, we arrive at Wilson Lock and Dam. This is a big one with a 93 ft. drop. 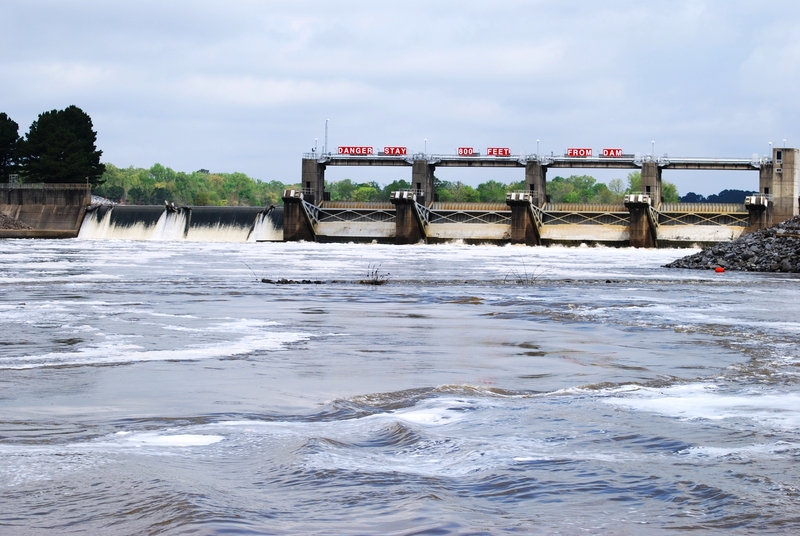 Named after President Woodrow Wilson, this is the largest dam on the river. When completed in 1925 it was the world’s largest. There are actually two sets of locks. The original lock consists of two chambers. We will be using the newer lock which was built in the 1950’s. When built this was the highest lift lock in the world. It now ranks 6th in theU.S. We have an hour delay, not by a barge but because there are divers in the water inspecting the lock doors. 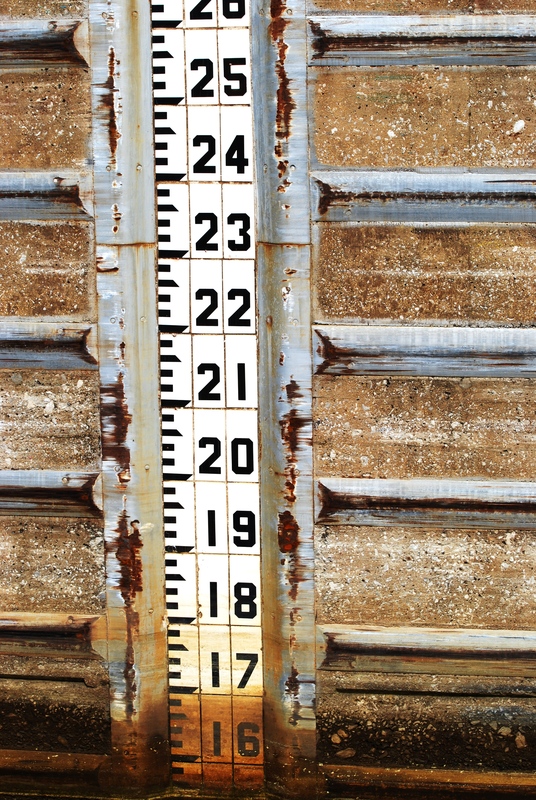 Once in the lock, our depth sounder reads 116 feet. It is a rapid ride down. 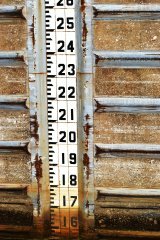 At the bottom our depth is 22 feet. 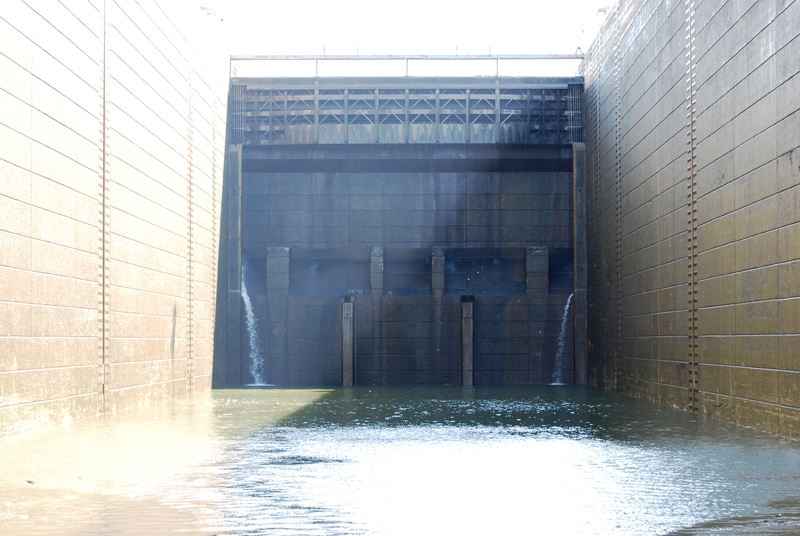 Once the massive steel doors open, we exit into Pickwick Lake. 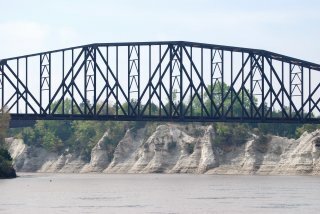 At mile 233 we pass under the mile long Natchez Trace Parkway Bridge. Just ahead we see our first tow of the trip, The Clareence G. Frame pushing 12 barges. Here with the wide deep river, the passing is worry free. 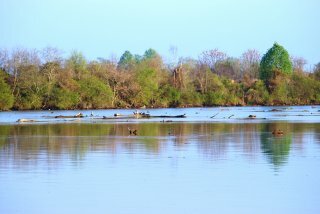 The junction for the Tenn-Tom Waterway is at mile 215 of the Tennessee River. Here we take a port turn into Yellow Creek. Our stop for the evening is just ahead at Grand Harbor Marina. 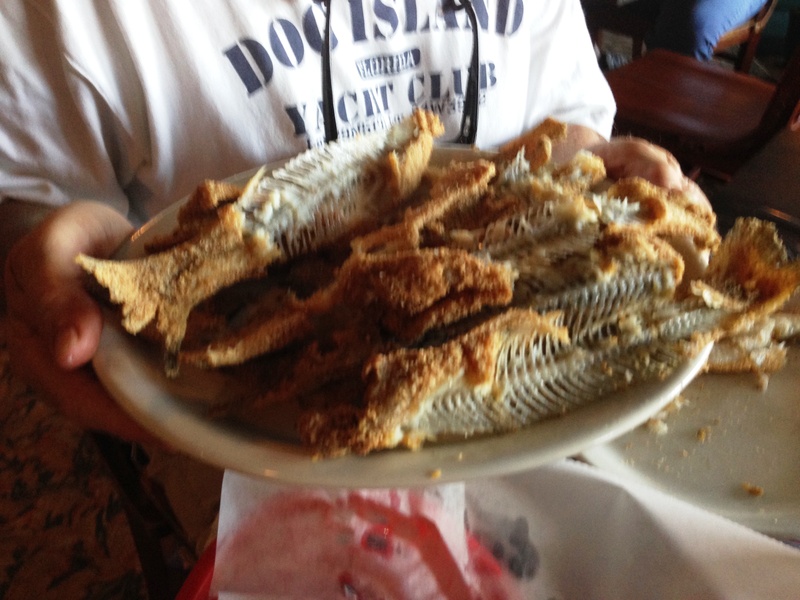 Our reason for stopping here at Grand Harbor was so that we could have dinner at Hagys Catfish Hotel. 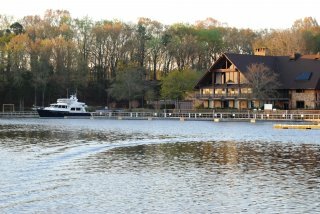 This restaurant, located along the banks of the TN River, is a local landmark. We discovered Hagys on our trip down the TN River two years ago. 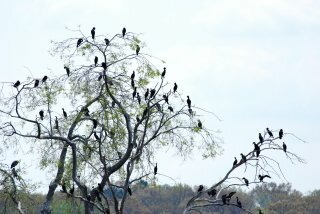 The all you can eat catfish was a magnet for Jeff. 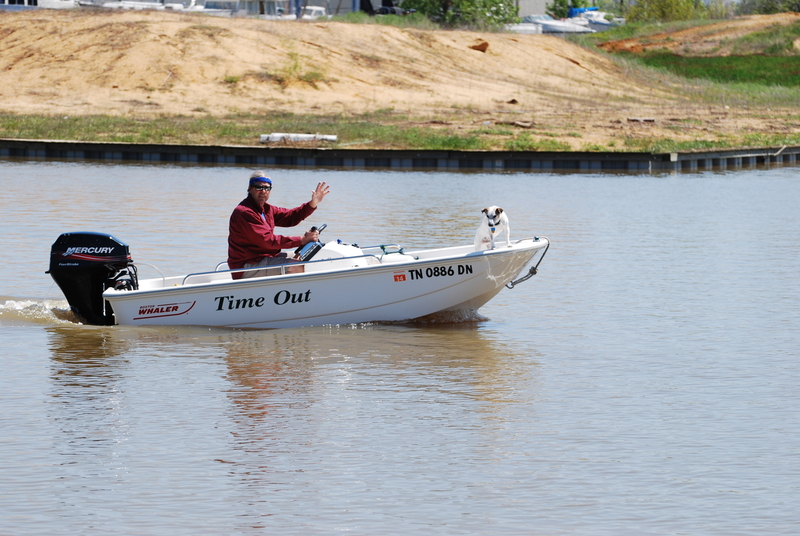 The marina offers a courtesy car for transient boaters. We have another great meal. So, I know the question everyone is asking: How many catfish did Jeff eat? The answer is three (3) orders of three (3) = Nine (9) whole catfish fillets!!! 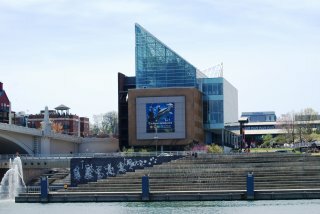 Today we begin our journey down the Tenn-Tom Waterway. 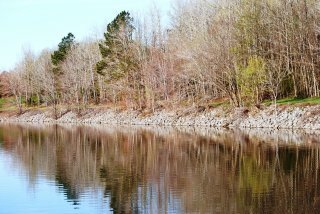 This waterway will be much narrower than the TN River with many twists and bends. 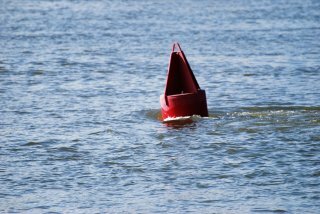 We will really have to be careful of approaching barges. They are much bigger than us and have the right of way. We do have Automated Identification System (AIS) on our computer. 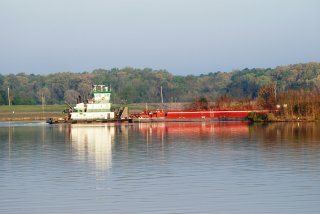 With AIS we can pick up a signal from the barges several miles before we can see them. The AIS will tell us their name, position, heading, and closest point of approach. We can then call the barge on the VHF ahead of time and let him know our position. AIS was very useful on our trip up the Tenn-Tom trip several years ago. The Tenn-Tom Waterway was officially opened in 1985. The total cost was two billion dollars. 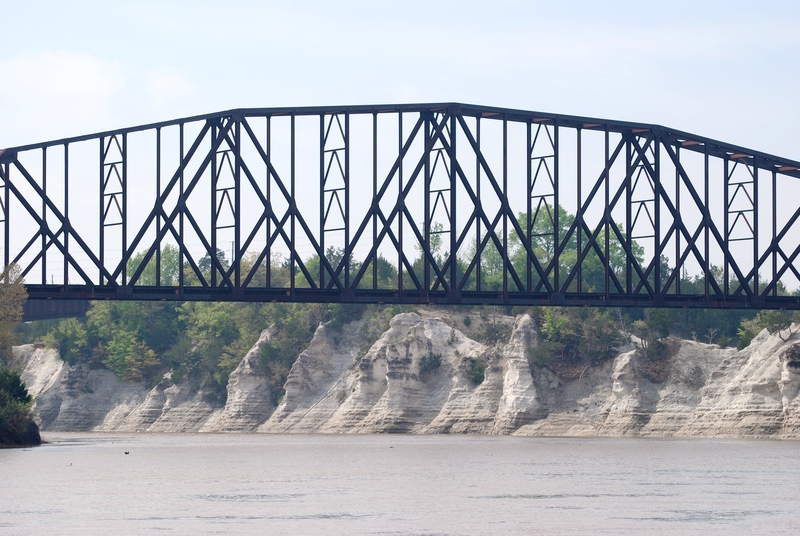 It is the largest civil works project ever undertaken by the Corps of Engineers. More dirt was moved to build the Tenn-Tom than was moved to build the Panama Canal. The system is five times longer and has a total lift 3.5 times greater than the Panama Canal. 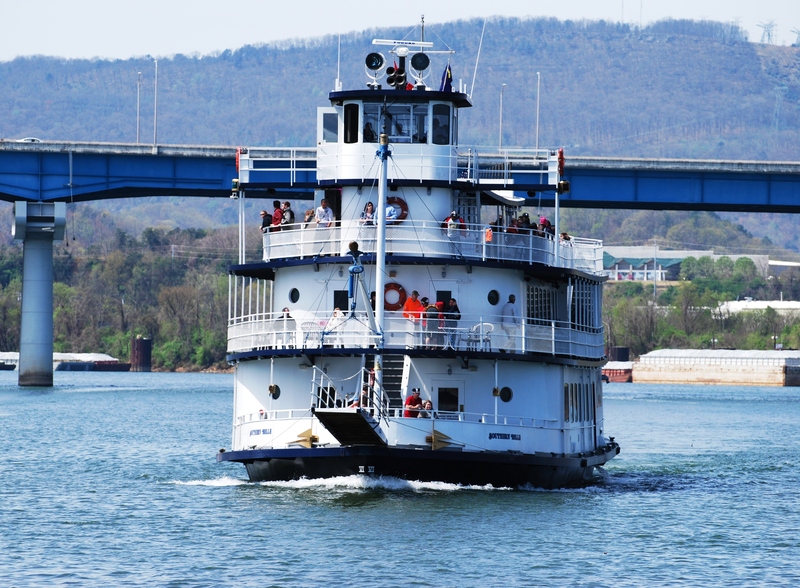 We will transit twelve locks on the Tenn-Tom Waterway. The first section we are traveling thru today is called the Divide Cut. It is a 39 mile long canal and took longer than any other section of the waterway to construct. 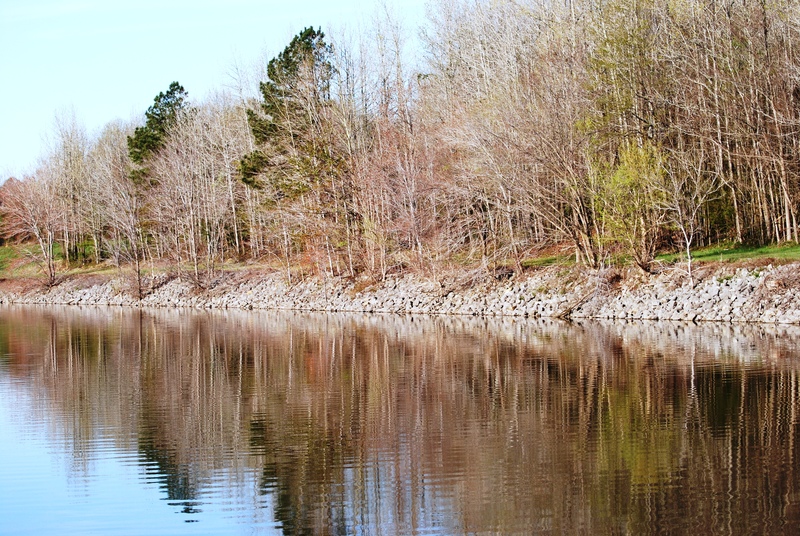 The channel with rock riprap is 280 feet wide bank to bank. Checking our AIS, no targets are found. Whitten Lock is our first of the day. Here we have an 84 ft. drop, the largest of any on the Tenn-Tom and the 9th highest in theU.S. Our anchorage for the evening is just above the Wilkins Lock. We anchor just off Smithville Marina in 8 feet of water at 7:00 PM. It was a long day with four locks. The stiff 17mph breeze made the locks a little challenging. We never saw our first tow, so that was a good thing. This morning our AIS shows The Jody McMinn headed upstream just five miles from our anchorage. There is no sense pulling up anchor until he is in the lock as we would more than likely be required to wait our turn at lockage for him. Our anchorage is just a few hundred yards above the lock. Our destination tonight is Columbus Marina. It is only 43 miles away. We will however have three locks to transit. All of the locks on the waterway are a standard 600 feet long by 100 feet wide. They have an average lift of 30 feet. 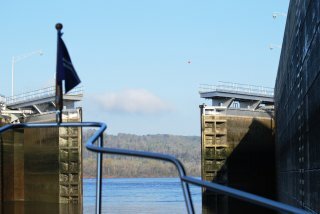 These locks are much newer than the TVA locks on the TN River and are operated by the Army Corp of Engineers. All of the lock operators have been very helpful. Because the locks are so close together, they call the next lock for you and let them know that you are coming. So far the locks are usually waiting for us when we arrive. Once the tow is clear of the lock we enter Wilkins Lock and are quickly on our way. 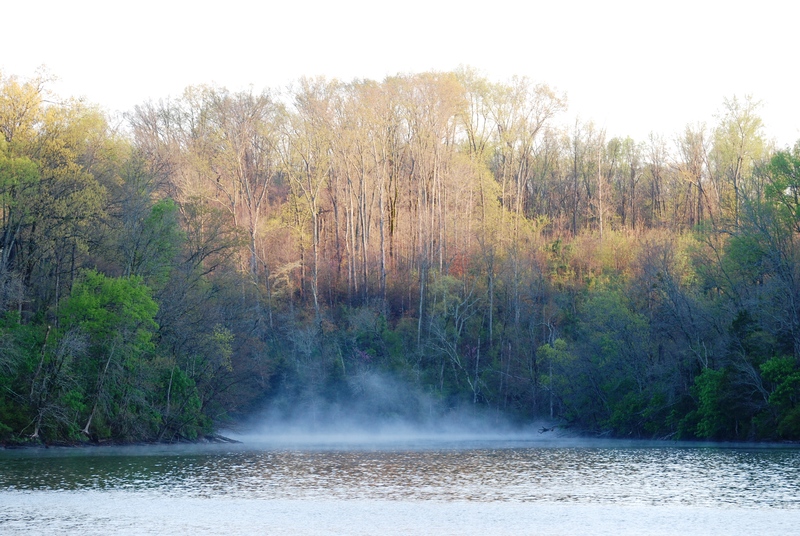 Amory Lock, 5 miles downstream, is within sight. 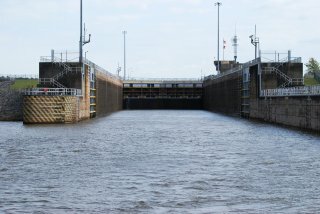 They know we are coming and the lock is ready and waiting when we arrive. After another 12 miles, we arrive at Aberdene Lock. They too are ready and waiting. Exiting this lock we check the river gauge located on the lock wall to get a picture of the river levels. Each lock has a gauge on both ends of the lock. 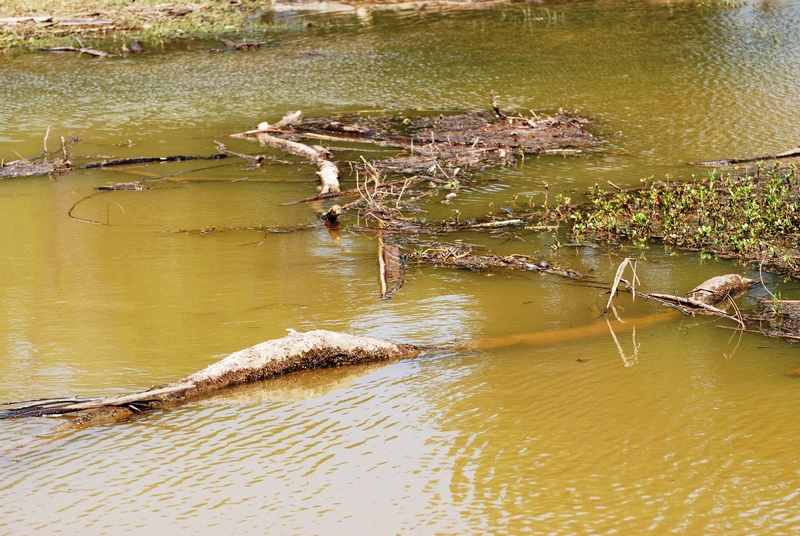 Knowing what the normal pools should be, we can tell if the river is high or low. This info is very helpful when entering some of these shallow anchorages. We have found all of the river levels to be running right at normal. The small but friendly Columbus Marina is our stop for the evening. Talk about service, there are 5 guys on the dock to catch our lines. The marina also has a courtesy car for boaters. The word thru the boating community is to eat at Hucks in downtown Columbus. So that is where we go. Our meal was excellent. The crawfish nachos, shrimp bisque, chicken gumbo, shrimp & grits, along with the red fish topped with shrimp and lump crab were all very good. We would come back here again. And no, we didn’t eat all of that. There are left over’s for dinner tomorrow. Today is another early start. 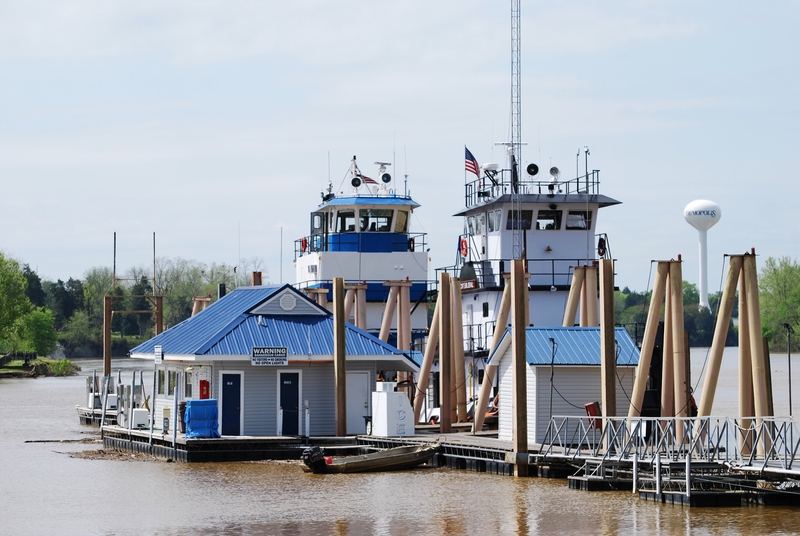 We will call the Stennis Lock before leaving the marina as it is just a stone’s throw away. Checking the AIS we see the tow “The Cecil” is inside the lock chamber. Our timing could not be better. The lock master tells us to come on in once the tow is clear of the lock wall. While being locked down, the lockmaster advises us that there are two other tows headed north today. At mile 328 we see the first up bound tow. Being a narrow section of river, we give him a call on the VHF to see which side he wants us. After several repeated calls and no answer, we make the decision to pass on the “One”. 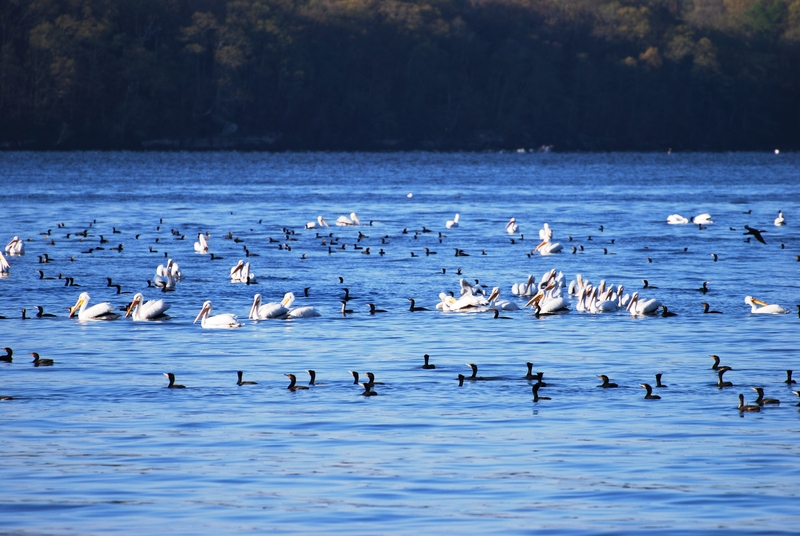 Along the river, Tow’s use the terminology of “one whistle” and “Two whistles” for passing. A “one” means that we pass port to port. A “two” signals a starboard to starboard pass. 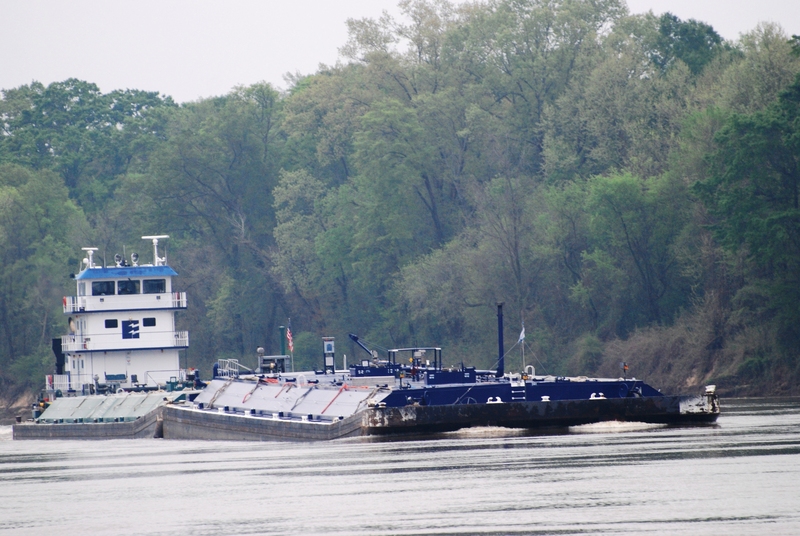 We meet our second tow, “The Leader” a few miles downstream. He does answer the VHF and tells us to see him on the “two” which is starboard to starboard. Luckily we have met both of these tows on a wide section of the river so passing is not too difficult. We reach the Tom Bevil Lock only to find a tow heading up river. We have about an hour wait while he is locked upstream. 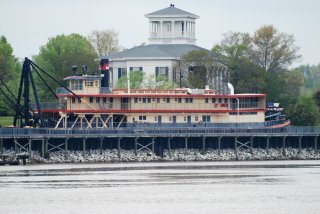 The 108 foot –snagboat Montgomer is on display along the river bank just above the lock. Built in 1926 this steam powered work boat kept the inland waterways navigable for over six decades. 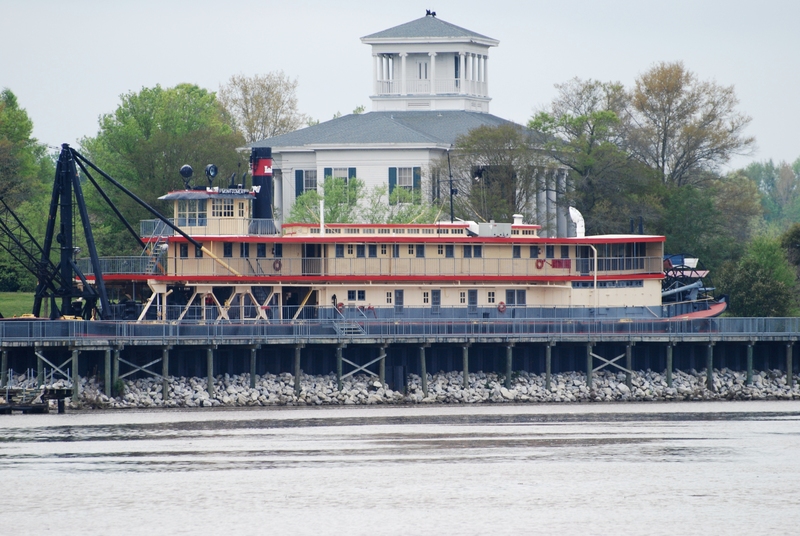 She was the last sternwheeler to ply these southern waterways. We have some excitement as we exit the lock. The flood gates are wide open and the current is ripping. It takes all the power IT can muster to keep us from crashing into the long concrete lock waiting wall. This is another reason that you really have to watch the rain fall when traveling these rivers. From here south there were tremendous rains a few days ago and we are just on the tail end of all the water. These rivers can rise and fall rapidly. We continue to see lots of debris, i.e. TREES, on the river. We have yet to see another cruiser on the Tenn-Tom, or R/V as the lockmasters call us. It is only us and the Tows as we wind downstream. We meet the Terrah Huckabee at the worst of all possible times. We had called her on the VHF but she never answered. We knew she was there and as we rounded the snake bend we hugged the green channel markers. It was tight with maybe 50 feet on either side. Whew!! No rest for the weary. We have another two tows up ahead. It looks like we are going to meet the first, Mr. David, in a really bad spot. We are super cautious this time and make a u-turn and head back up stream to wait for him at a straight a way. These guys aren’t giving us much wiggle room but we squeak by with a few feet to spare. This tactic worked much better than chancing it on the curves. With anchorages few and far between, we decide to stop at our first choice of Cooks Bend. This one looks good and we don’t know about the ones farther down. Entering mid channel we see no less than 15 feet. We travel up the bend several hundred yards and anchor into the current. We don’t have much swing room but the current will keep us pointed in one direction. From here we have a great view of the river channel as the tugs pass heading up and down river. We can hear their rumbles long before they appear. After a peaceful evening at anchor, our bodies are recharged and we are once again ready to do battle with the river. Exiting the cutoff, our depth sounder screams at us as she counts down to 6 feet. We draw 5 feet. Coming in yesterday, we never saw less than 15 feet. We should have been closer to the upstream bank when we exited the cuttoff. We will know better next time. 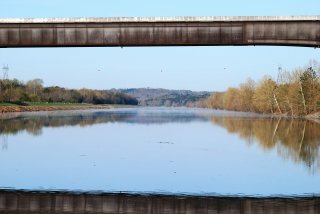 The river seems much more tranquil this morning. 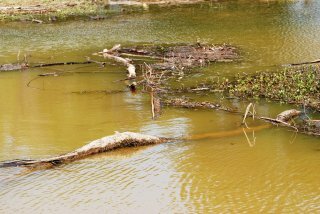 There is still lots of debris in the water but not as much current. We keep a vigilant lookout on the AIS for any targets. 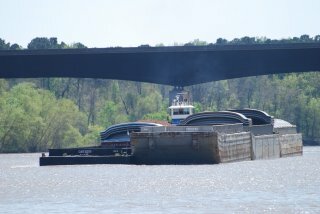 After a pleasant 12 miles cruise, we reach the Heflin Lock. The river levels below Heflin are high, very high. At mile 242 we set up a good pass with the tow Honest Bob. Unlike some of the others, he is very courteous and gives us a wide berth. 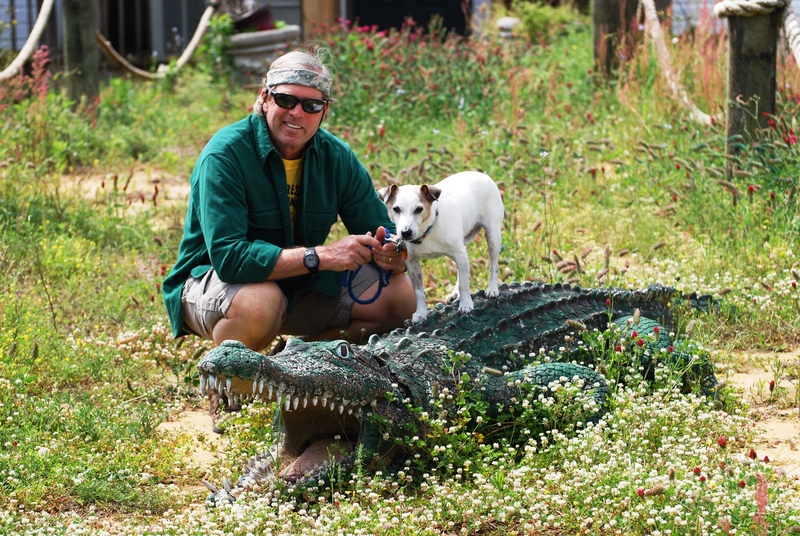 We ask him about the water levels below Demopolis. He said they are very high. The river is 10 feet above flood stage and there is more rain coming tomorrow. 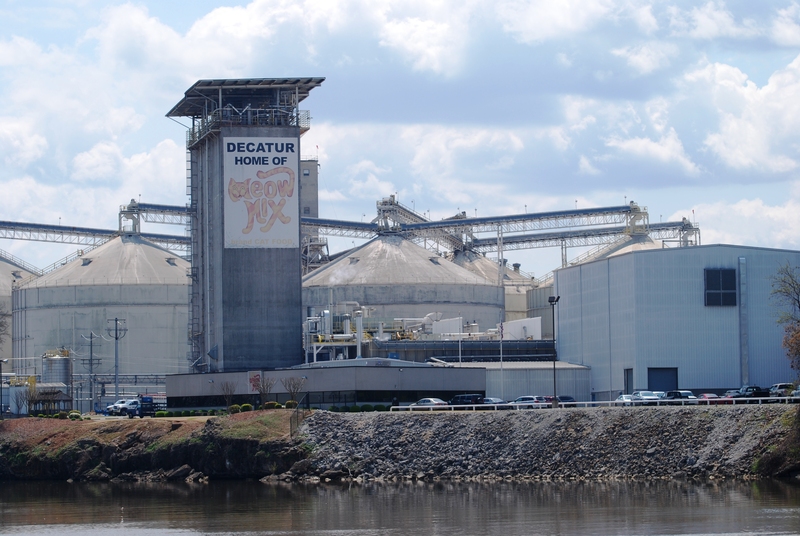 Because of this, we have decided to stop in Demopolis for several days and let the river settle down some. Honest Bob was very helpful giving us lots of useful information and also told us there were no tows behind him. 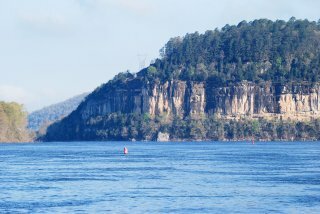 At mile 252 we pass the Cliffs of Epes, probably one of the most interesting sights along the river. Mile 225 marks our half way point on the Tenn-Tom. At mile 217 we officially leave the Tenn-Tom Waterway and enter the Black Warrior-Tombigbee Waterway. 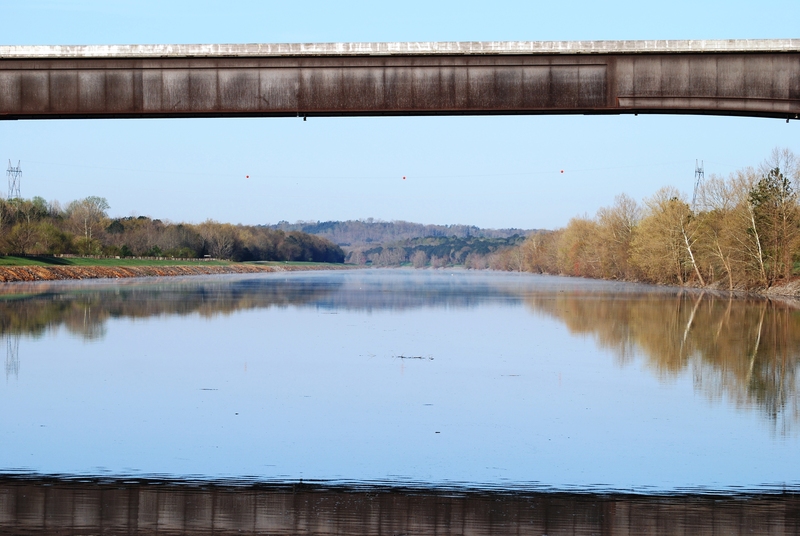 The Black Warrior River spills into the Tenn-Tom Waterway at this junction. 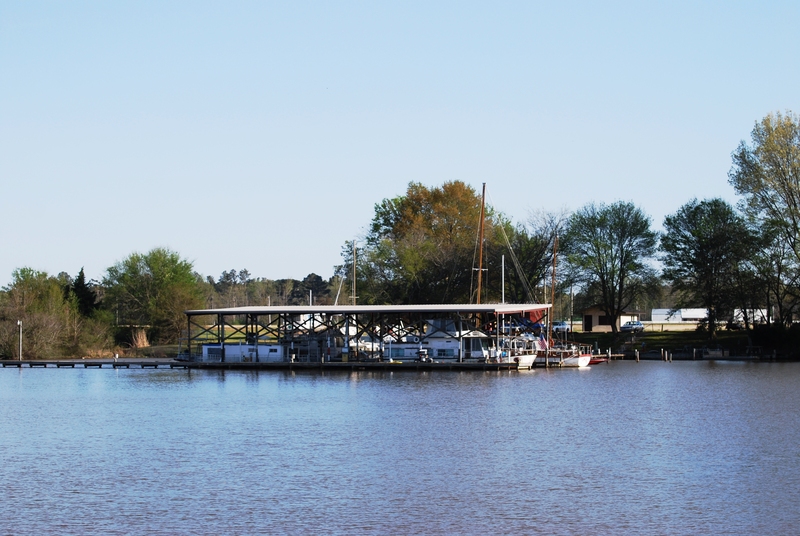 Kingfish Marina at Demopolis, our home for the next few days, is just ahead. This entry was posted on April 17, 2014 at 7:46 pm. You can follow any responses to this entry through the RSS 2.0 feed. You can leave a response, or trackback from your own site.